To say this is the realization of a dream would be a significant understatement. More about that under "Chasing the Horizon". Formerly "Jersey Girl", she was owned by Capt Dan McLaughlin. She's entertained some notable people, including Dave Barry, (click here for an article Dave Barry wrote about the Jersey Girl) George H and Barbara Bush, and Dale Earnhart Sr.
Capt Dan went to Fiddlers Green Nov 13th, 2007. We miss you, Capt. Good-bye Capt. Dan Capt. George "Dan" McLaughlin Sr., 73, of Toms River, NJ died Tuesday, Nov. 13, at home. Born in Paterson, he lived the first half of his life in Toms River and then the second half in the Florida Keys, returning recently to Toms River. He was the owner/proprietor of Key Dear Bar & Grill, Big Pine Key, Fla. Dan was a U.S. Navy veteran, serving during the Cuban Missile Crisis. He was a member of the Moose Lodge, Big Pine Key, Fla. He was a Modified Race Car Driver and enjoyed all aspects of the sport. During his time in the Keys, Dan charted a sailboat, bringing passengers from Miami down to Key West and back again. He was predeceased by a granddaughter, Shannon McLaughlin. Dan is survived by a son, George "Dan" McLaughlin Jr. of Toms River; four daughters and three sons-in-law, Donna Ann DeCicco of Barnegat, Janine and Brian Berhens of Toms River, Kathleen and Brian Wilbert of Forked River, Lacey, and Lisa and Scott Goodale of Toms River; 12 grandchildren, Tommy, Sean, Jena, Christopher, Edward and Kristen DeCicco, Tony and Mark Spina, Tiffany and Kyle Wilbert, and Shelby and Zachary Goodale; and his fiancee, Deborah Stubblefield of the Florida Keys. A memorial gathering will be from 2 to 5 p.m. Sunday, with a funeral service at 4:30 p.m. at the Carmona-Bolen Home For Funerals, 412 Main St., Toms River. In lieu of flowers, donations to the American Cancer Society, Jersey Shore Region, 1035 Hooper Ave., Toms River, NJ 08753, would be greatly appreciated. Won't you take me away boys, my time isn't long. And I'll see you someday in Fiddler’s Green. I'll see you some day in Fiddler’s Green. We can't believe it. Capt Dan gone? We are the folks who bought his sailboat, the Jersey Girl, now known as Lucidity. 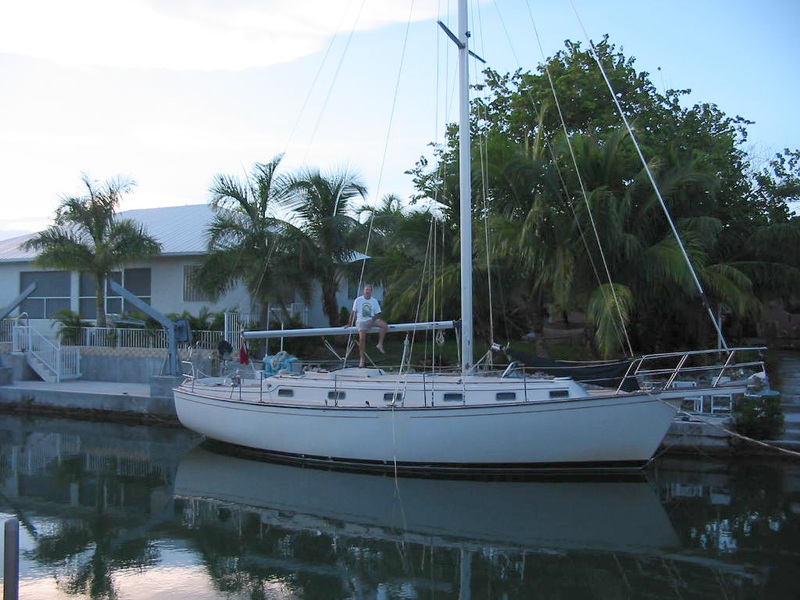 We had plans to be in the Keys this coming November and take him out for one more sail on her. I'm really, really sorry that won't happen. When he sold us the boat he was as teary eyed as if he was losing a family member, which in a sense he was. We'll miss you, Capt. "So we'll go no more a-roving, So late into the night..."